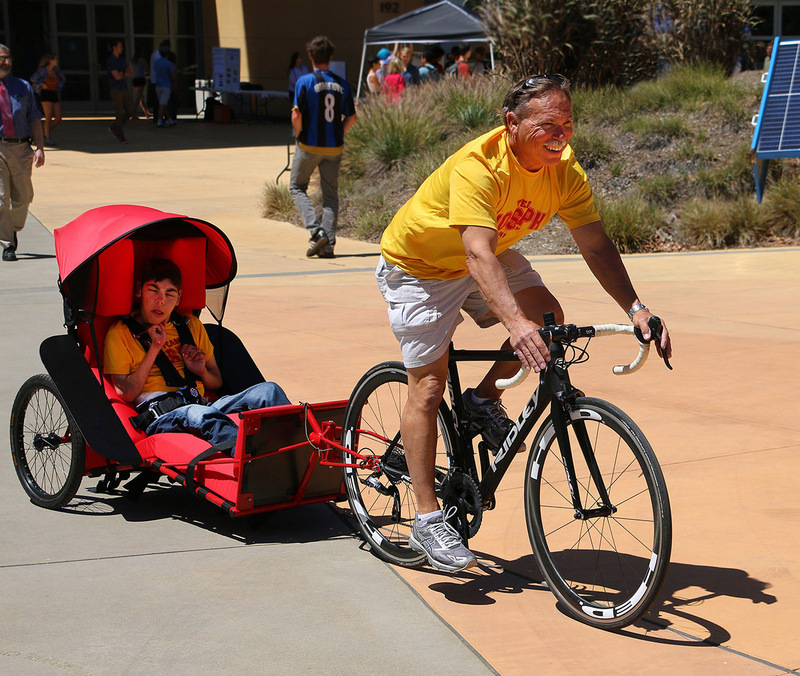 SAN LUIS OBISPO — Cal Poly engineering students have once again contributed to the heart-warming story of Joseph Cornelius, creating a unique bike trailer that the special needs man can use to participate in the July 22 SLO Triathlon with his father. Cal Poly students have now completed three projects that Joseph can use to compete in each of the triathlon events. Joseph, 24, has cerebral palsy, which prevents him from walking or talking. Those symptoms became apparent when the Los Osos, California, resident was a baby. “He used to have 75 to 100 seizures a day,” said his father, John Cornelius. As Joseph grew older, Cornelius could see that his son reacted well to assisted walks. And soon he began running marathons with Joseph, pushing his son in a wheelchair. The inspiring father-and-son duo, along with a crew of supporters, were dubbed Team Joseph, easily identified by their bright yellow shirts. Eventually, the Special Olympics paired with Cal Poly students to help the father and son participate in triathlons. In 2014, students created a 6-foot by 4-foot flotation device — the “Aquabullet” — that allowed Joseph to glide on water, feeling the sensation of swimming, as he’s towed by a swimmer. And in 2017, students created a jogger for Joseph. That left one more event: bicycling. Since Joseph’s previous trailer lacked safety and comfort features, three mechanical engineering students set out to create a new trailer. The students — newly graduated Keely Thompson, from Encinitas, and Ryan Meinhardt, from Sammamish, Washington, and senior Curtis Wathne, from Santa Barbara — were all members of Cal Poly’s Human Powered Vehicles Club, whose members love to ride bikes. “The team met with Joseph and his dad, sometimes weekly, and did multiple custom fitting sessions as the design and build progressed,” said faculty advisor Sarah Harding. “They really got to know their customer and his unique needs. The trailer they designed has a steel roll bar, a five-point racing harness, a custom seat and an attachment that allows the trailer to stay upright in the event of a bike crash. “The key part when we sat down was safety,” said Cornelius, a retired Rite Aid store manager who has a degree in biomedical engineering. The trailer also features a carbon fiber footplate, since Joseph’s spastic quadriplegia caused him to break previous footplates. Aluminum fenders prevent him from coming into contact with the wheels, and better suspension and shade hood to protect him from harsh sunlight. The team first introduced Joseph to the trailer during the Project Expo, a College of Engineering’s annual display of student projects, in May. Once Cornelius pedaled off on his bike, Joseph smiled in his trailer, Thompson said. The Cal Poly projects, Cornelius said, have given Joseph more freedom to be active, which has impacted his physical and mental health. The trailer frame could have universal appeal for adults with disabilities, Harding said, even though Joseph’s seat cushions were custom made to fit his unique body frame. Just helping one person was rewarding, Thompson said. While Joseph’s early years were especially difficult, he and his father have participated in dozens of events together in recent years. “Now we just make up for lost time,” Cornelius said. Joseph Cornelius rides in a bike trailer as his father leads the way on a bicycle during the College of Engineering Project Expo. The trailer was designed and built by Cal Poly mechanical engineering students.